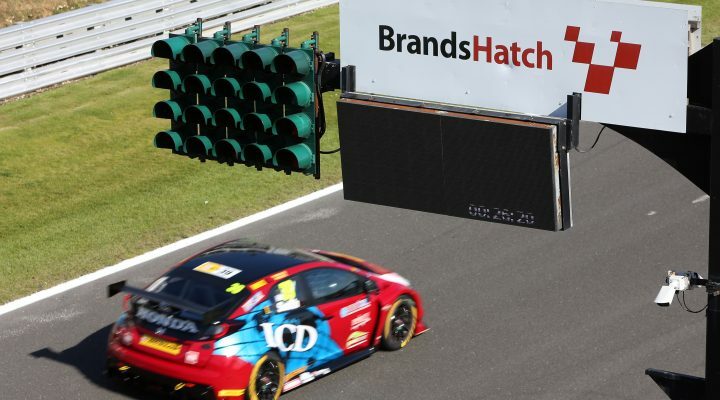 Brett Smith pipped Eurotech Racing team-mate Jack Goff in the final BTCC free practice session at Brands Hatch. The young rookie has been in fine form so far this weekend, following up his fourth place in FP1, by setting the fastest time overall in the second session. Goff ended up just 0.111s behind his Honda Civic Type R stablemate, whilst reigning champion Gordon Shedden made it a 1-2-3 for the Japanese marque. Ciceley Motorsport’s Adam Morgan backed-up his earlier pace-setting showing with fourth place in his Mercedes A-Class, whilst Tom Ingram was fifth for the second successive session. Ingram is odds on favourite to clinch the Independent Drivers’ crown, but he has Goff chasing him down so he’ll need to remain at the sharp end throughout the weekend. Dave Newsham has been a consistent top ten runner in recent times and sixth place for the Chevrolet Cruze was just reward for the efforts put in place by the fledgling outfit. Local man Jake Hill claimed seventh ahead of Adrian Flux Subaru Racing duo, Ash Sutton and Jason Plato. Team Shredded Racing with Duo’s Rory Butcher rounded out the top ten. Qualifying is next up at 1505 and will be streamed LIVE over at itv.com/btcc.